My neighbor Allison and I have developed a habit of going out for ramen soup or pho once a week. 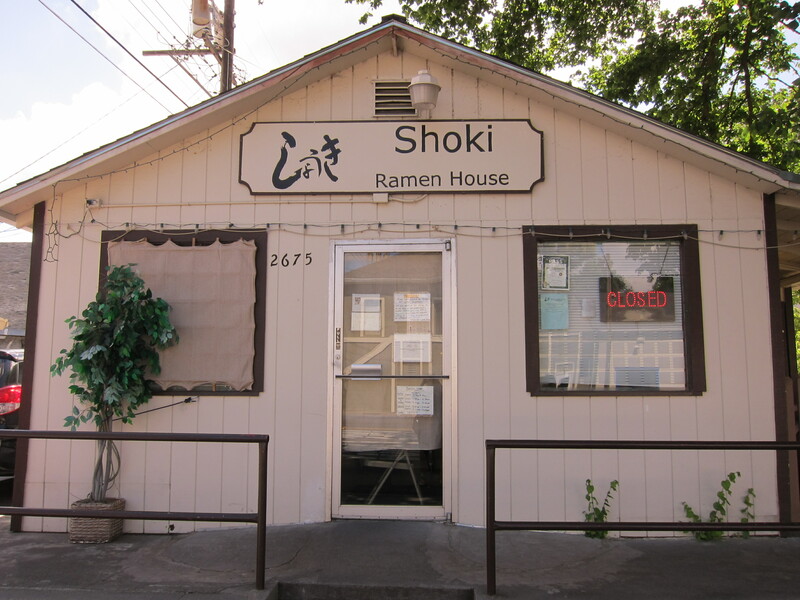 We acquired the habit as a result of not being willing to wait for a table at Shoki, the most conscientious ramen house in Sacramento, perhaps in northern California (or north of the Bay Area). The soup is so good — or Sacramentans are so starved for decent ramen — that people are willing to wait until someone gives up one of the twenty-five seats. Shoki’s is small and cramped. We don’t tend to linger there. I regret starting out this review by concentrating on how uncomfortable it can be inside. But it almost dominates the experience of eating there. However, moving past the discomfort, you have a choice of three soups. Soy-based soup, sea-salt based, and Tan-tan Men, the beef-shoyu based soup. The broth is flavorful. The noodles firm. The slice of pork in the first two soups is generous. Whichever I order, I now have a standard way of ordering my ramen soup. It’s very technical, like ordering a latte. I always ask for whole-wheat noodles, less boiled, with an soft/hard-boiled egg, and extra spinach. If I’m really hungry, I like ordering a plate of steamed cabbage to eat with it. But, to my mind, asking the ramen chef, Ueyama, for firmer noodles — i.e. less boiled — is the key to my happiness when I eat ramen soup. And the runny egg yolk. Shoki acquired a reputation for being hard to get into. As a result, I can now get a seat, because people are staying away. The manager promises to open a midtown Shoki in a few months. Perhaps that’s a good thing. For now, I’d rather Shoki retain its reputation of long lines of people outside on the sidewalk. It means I’ll get a seat when I stroll over for an early lunch.